180° rotation at the base, 90° vertical adjustment and 180° worksurface rotation. Move left slider up & down for an effortless product demonstration. According to exercise physiologist Jack Groppel, movement and exercise, even on a minimal level, stimulate blood flow and oxygenation to the brain-a sense of feeling better which boosts productivity. In a recent study published in the Journal of Occupational and Environmental Medicine, Stanford University researchers concluded that lower back pain may be improved through the use of sit-stand workstations. Long periods of sitting slows the metabolism, which impacts the body's ability to regulate glucose, blood pressure and the ability of the body to break down fat. 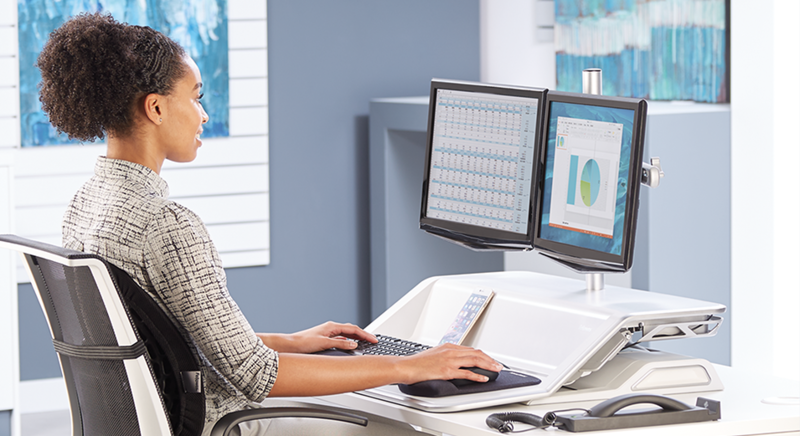 Active seating solutions, including the Fellowes sit-stand workstations, are useful ways to introduce movement while working in an office setting. Sign up for product news, tips and special offers from Fellowes. When you put your name on everything you make, you make certain everything is just right. It’s been that way for four generations with the Fellowes family and why the name means something to four generations of customers.